I know...let's publish Monday's post on Sunday...just to confuse you. 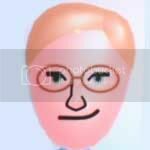 Sorry I haven’t been around frequently to your blogs. You see, VE has been very busy giving his time to humanitarian pursuits. 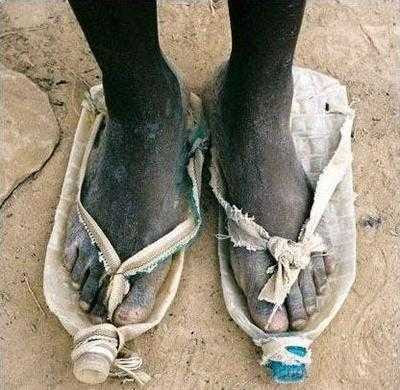 I’ve been over in Africa providing affordable footwear solutions to those that have feet. Yes, VE’s 2-Litre flip-flop line has been a huge success. We had a few snags along the way though. We had to deflate the bottles completely to avoid any entanglements with Nike and Air technology. 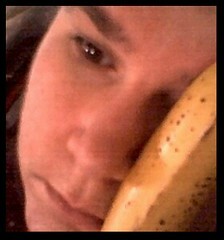 But we are hopeful in the future to be able to sell them partially filled with air to provide that cushioning comfort. We’ve been slowly using the smaller water bottles to provide toddler’s adequate footwear as well. The green bottles are proving to be the most popular design in the desert locales. “It’s hard to find anything green out here” commented one dirt poor customer. Next up are cool hub cap hats. They’re light, durable, provide lots of shade and utterly ridiculous. The Africans will love them. I’ve already lined up my supplier. Hey, I thought you said you didn't understand fashion. Get a couple of celebrity endorsements and you could go from humanitarian to clothing designer extraordinaire! They'll not just steal your hubcaps, I saw one walking down the street with a backpack in it's mouth. Bearcubs are little hoodlums! First let me say kudos to you for your Green Concept. Next you know you can make slippers out of Maxi-pads don't you? I mean I wouldn't out of used ones but hey that's just me. I can see this catching on. I know a girl who makes bags out of bike tires. I would have never guessed that they could be so popular. Awesome shoes. You could die the cloth different colors using leftover blood for sacrifices. As for the hubcap lady, did she make that dress out of her kitchen curtains? I didn't know John Kerry Flip-Flops were back in fashion? carla - Cool. I've seen bike inner tube chairs but never a bike tire bag. So where do paypal my pymt? Gotta have me those flip-flops. first it was plastic bags as outerwear. then sumo diapers for everyone. and now plastic bottle shoes. i can't wait to see what's next. That woman is way to happy for someone that has that many hubcaps. maureen - We insert a rubber lining so it's ok. Plus...it makes your head sweat profusely. jaime - Boy...you never know with me. Whatever it is it'll be different. fancy footwear - quite a talent you have! At least the pop bottles are being recycled. That can't be comfortable, though! You just wait. Marc Jacobs will be knockin' your flip-flops off and taking all the credit. Is your hubcap supplier related to Borat? 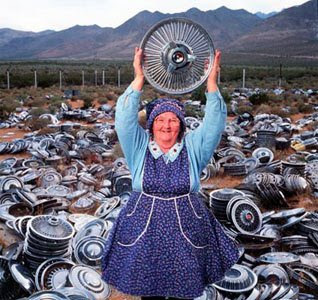 When I grow up, I wanna be just like the hubcap lady. Except maybe with a few more teeth. I think we could all chip in by drinking all of the water from our over priced bottles and shipping the empties to the Dark Continent. What could be more helpful than that? Cheers!! quickroute - You might need a pair as you are into nomad mode now! arizona - And high heels are? Sending plastic bottles for shoes is so much more eco-friendly than sending old computers over there for them to disassemble for scrap metal! And is better for their health, too. is that bear playing frisbee? Grab a tow rope and you could waterski on those puppies! anne - They need recreation too! I think if you have 2-liter flip-flops then you are more like dirt middle class. And hubcaps? Puhleeze, where do these people live, Rodeo Drive? roy - Dirt can be expensive sometimes. Look at water world! That's right - you're not really poor until you have to drink your won urine! Those flip flops are ingenious. $29.95/month you get to go over to her place (in the Ural Mountains) and pick any hub cap you want for free! Plus you get overrides on anyone you sponsor after you sponsor your first 500! Its too good to miss out on. Do you have Evian slippers? If so, and you can guarantee a nice hemp rope instead of that frayed cloth, I'll take a pair. Please make sure no bears have licked them. I feel like such a stupid westerner. If I found myself with no shoes I would not think to flatten some soda bottles and tie a rope to them to use as shoes. Genius! sarah - I must caution you though that the life of the soda bottles is only around 10,000 years. Nice sandals. You should check out today's Grimmy (www.grimmy.com). I think he stole your gnomes. Aww man, my mom stole the hubcaps to my hyundai again. I'll order a pair of those 2 liter sandals. Diet please. abbie - He can have them. They're pretty ornery... I'll got check it out anyway. Now you are really thinking Green....just think of all the things we dispose that can be made into fashion forward trends.. why this is only the beginning! That bear has dropped his hat. Somebody should help him put it back. Someone tasty. I know a place here in Pennsylvania (big shock there, I'm sure) where she can get a new supply of hub caps for her hats when you need them. Just let me know. It's this place I used to pass on the way to my parents when I lived "downstate." Now live "upstate," much different world-- the land of thousands of hubcaps. That little old lady stole my bloody car! I take back what I said above about the zombie statues. THAT women is freaky.